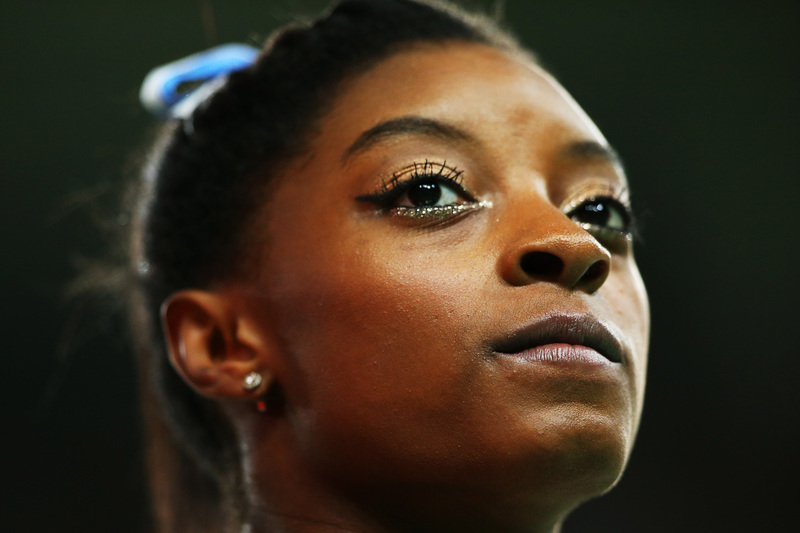 It's safe to say that at this point, Simone Biles has become a household name. As the 19-year-old solidifies her role as the greatest gymnast of all time by winning the all-around gold medal in the gymnastics championship at the Rio Olympics, there is little doubt in anyone's mind that Biles is in a class of her own. In an interview with Omnisport, during which she discussed her role in history, Simone Biles' comment about Michael Phelps was very inspiring, and proves that she not only is the best gymnast in the world, but that she's also brilliantly self-confident. I’m not the next Usain Bolt or Michael Phelps. I’m the first Simone Biles. This quote speaks volumes about Biles' view of herself. Rather than demurring about her stunning skills and accomplishments, she not only owned her incredible talents, but also refused to be compared to famous male Olympians. While calling someone the "Michael Jordan of" (or, in this case, the "Michael Phelps of") their sport is meant to show his or her greatness, Biles knows she is more than just another version of these famous Olympians — she is a category unto herself. Being a professional athlete, much less one who makes it to the Olympics to win gold, requires an incredible amount of confidence and mental grit. To not only be an Olympian but to win all-around gold and be called the greatest of all time is inspirational enough for a lifetime; for Biles to then own that world-changing accomplishment and refuse to have her successes measured by that of men can and will inspire an entire generation of girls and women. I was built this way for a reason, so I'm going to use it. To go out there and prove what I can do has taught me a lot about who I am. We can push ourselves further. We always have more to give. To accept and celebrate one's body, one's amazing successes, and exclaim to the world that you are yourself, is revolutionary. For a young black woman to do so might just usher in a change women all over the world need.